Kids are fascinated by bright red engines racing off to fight fires so it's no surprise they might request a fire truck themed birthday party. Incorporate these heros and their vehicles into all aspects of the day, and you're sure to delight the birthday boy or girl and guests. Die-cut invite - Search for invitations in the shape of a firetruck and have party information printed on them. Truck graphics - Fire truck graphics can be featured on a standard size and shaped invitation, complete with firefighters, hoses, and hydrants. Embellishments - Pick up some themed embellishments to add to a simple red invitation. Tie them on with black ribbon. Set the scene with your decorations. 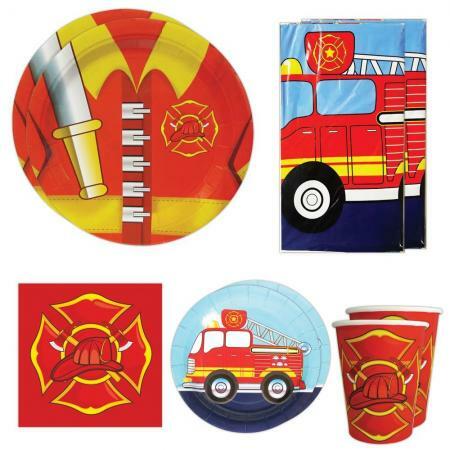 Tableware like plates, napkins, and cloths come in a variety of fire truck designs are a given. You'll also want to put out your child's fire truck toys and accessories. Then add to your basics with more fun décor! The walls provide blank spaces perfect for setting the scene. 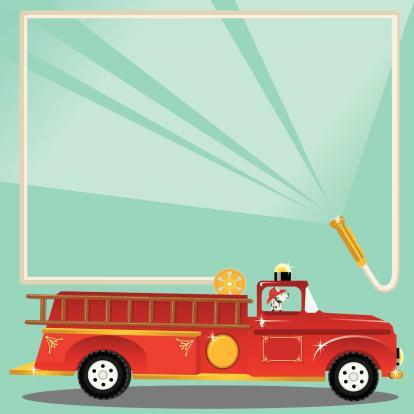 You can purchase scene setters that resemble a fire station or large posters to hang throughout the space that feature firefighters and trucks. For a really neat photo opportunity, use craft paper to create a large red (or yellow) fire truck that covers the wall. Add old tires (or cut out black circles) in appropriate spots. Prop up a ladder behind the truck. Have the kids stand together in front of the fire truck in hats and have them hold a gray garden hose so they look like they are fighting a fire in front of the truck. Decorate windows with tissue paper flames. Cut red tissue paper in the shape of flames. Then cut orange and yellow in smaller sizes, respectively. Tape them to your windows for a neat lighting effect as well as decoration. Light bar above the doorway. This could be an actual working light bar or you could cut one from paper. Blue paper cut into a rectangle for the windshield. You could put a birthday message in here, such as "Welcome to Sarah's Party!" Square gray paper for the grill, centered below the windshield. Two big yellow circles for the lights to each side of the grill. Gray paper for the bumper. If you have a couple old tires, you could stand them up on each side of the doorway for a 3D effect. Entertain everyone by planning several games and activities that will keep kids busy throughout the party. Keep a few fire engine coloring pages on hand in case you finish activities faster than expected. Call grocery stores and appliance stores to get their large used cardboard boxes. You should have at least one per child although a few extra would be helpful in case there's an accident. Once kids don paint shirts, let them paint their engines red or yellow and add ladders, windows, hoses, and more. This is a good activity if you have a large backyard or basement. You don't need to have an actual fire hose to play this game, but you do need to be outside. Paint cardboard to resemble a simple house with flames coming out of it. You'll need two. Prop them up at the edge of an outdoor party space. Divide kids into two teams; fire hats and jackets are optional. Give each of the teams a gray garden hose to resemble an actual fire hose. After a short countdown, turn the water on. Kids need to hose down the target (the cardboard house with flames) until it tips over. 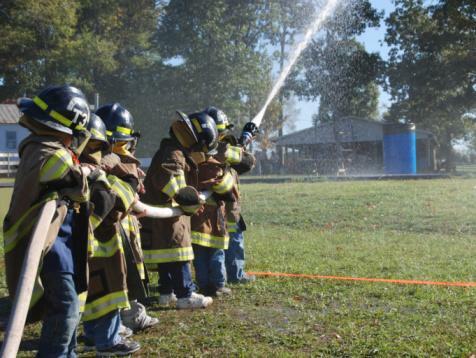 Make the birthday boy or girl's day by inviting an actual firefighter or two to visit the party. He or she could talk about their job, the different features of a truck, and fire safety. Request the firefighter(s) bring gear with them so they can show kids what it's like to be on the job. You could ask them to stay and help kids make fire safety crafts like hats and posters. Set out a bowl of Flamin' Hot Cheetos or some jalapeno poppers. Regular cheese puffs and cheese balls are also good options. Serve cut vegetables, crackers, and potato chips with some spicy sauces along with traditional sour cream or Ranch dressings. Bananas, apples, and carrots can all be served to represent the color of trucks and fires. Pepperoni pizza with red pepper flakes add a little kick while sticking to the red theme; be sure to have plain cheese available, too. 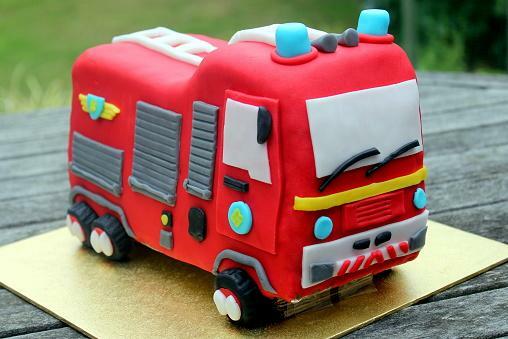 Serve a fire truck themed cake. A shaped cake can double as a centerpiece while a sheet cake can have a birthday or other celebratory message. Complete the day by sending home guests with fire truck favors they will enjoy after the party. 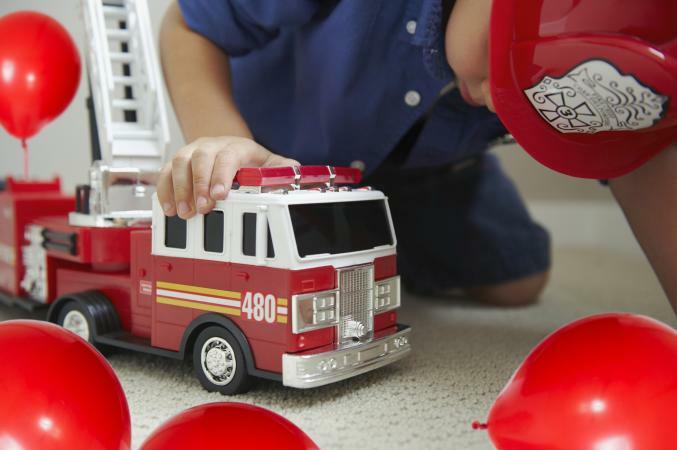 Small toy fire trucks are a good idea, but pairing them with fire truck balloons takes them up a level (and can help serve as decorations). Books about fire trucks also make great parting gifts that kids will enjoy after the festivities end.